NATIONAL SEPTIC WEEK…yep, it’s a thing! 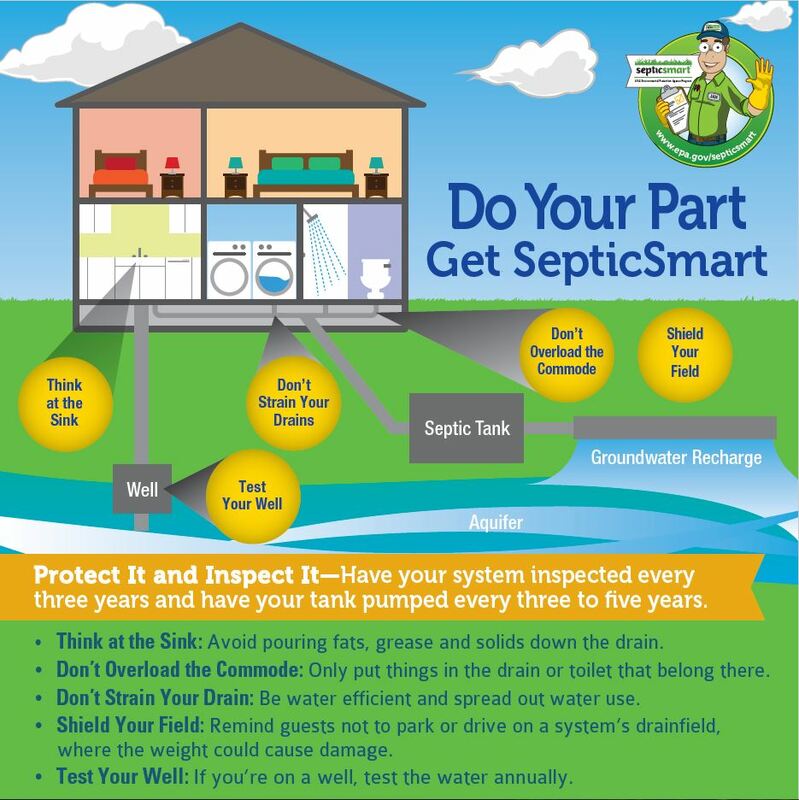 Home » Uncategorized » NATIONAL SEPTIC WEEK…yep, it’s a thing! So, I realize it has been a while, but I was so excited to learn some super “fun facts” about my industry! Did you know, there is a National Septic Week?! I promise, I’m not lying. When you have a clog, either use boiling water or a drain snake to break it free. Paints, solvents, or large quantities of chemical cleaners should never be poured down your drain. Whenever possible, reduce or eliminate the use of your garbage disposal. These food particles put unwanted greases or oils in your system that can tweak with the layers of your septic tank. Never flush anything — solids or liquids — besides human waste or toilet paper. (Side note — the cheaper lesser ply toilet paper is best for dissolving in the line and tank. It’s a little crass, but if you can remember “the better it feels the worse it is for your septic system” as a rule of thumb on your toilet paper choice). Conserving water is key to your septic system. We don’t often realize how much water we use in a day. According to the EPA, the average person uses 75 gallons of water per day. The less water we use, the easier it is on the septic system and the longer life your system will have! Always consider installing high-efficiency toilets, shower heads, washing machines, etc. All these appliances can help reduce the water flowing to your system. Do NOT DRIVE on your lateral/drain field. This can damage the laterals underneath that are dispersing the water below. Only plant grasses or plants with small root systems on the drainfield. Trees and shrubs should be kept at least 30 feet away from this area. Their large root systems can damage a field over time. Be mindful of where your stormwater drains to — try to keep your lateral field free from excess water as much as possible. Don’t “water” your lateral field. Though we understand you might want a pretty green lawn, make sure your sprinklers aren’t saturating your drainfield too! Set a regular schedule to have your tank pumped by a certified professional. It is recommended every 3-5 years to have your tank pumped based on the activity level in your home. The more people living in your home, the less time you want to wait between pumpings. Keep records of your system location and design. This can be useful in the future. Also, keeping records of each pumping too!